Capital and chief city of the state of Massachusetts in the United States. 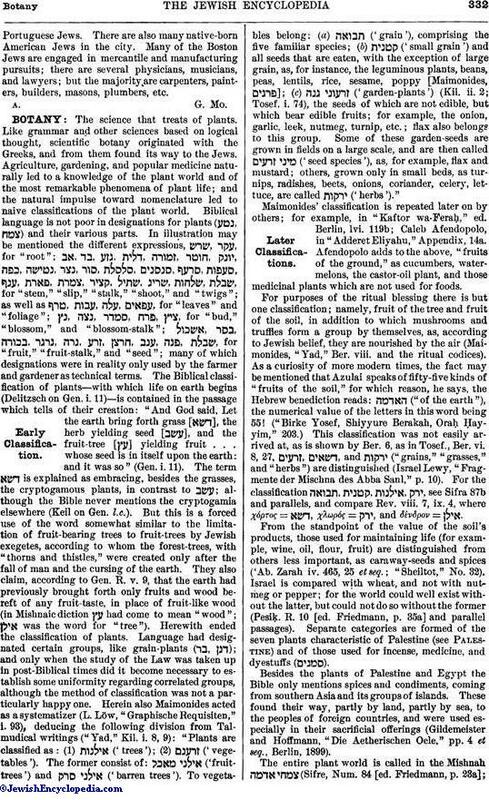 Nothing definite is known of Jews in Boston prior to 1842. In that year there was established the first congregation, whose founder and first president was William Goldsmith. In 1843 this congregation purchased the first cemetery for Jews in East Boston. The second congregation, now known as the Temple Adath Israel, was organized in 1853. The first election of any Jew to public office was in 1875 when Godfrey Morse was elected to the school committee of the city of Boston. Leopold Morse was elected a member of the United States House of Representatives in 1876. The first Jew in the common council was Isaac Rosnosky, elected in 1878, who was also the first Jew to be elected (1883) to the Massachusetts legislature. Godfrey Morse was elected president of the common council in 1883. Bunker Hill Monument, the most notable memorial in Boston, owes its erection in part to the generosity of Judah Touro, who donated for the purpose the sum of $10,000, nearly one-fifth of the entire amount received from private sources ("Pub. Am. Jew. Hist. Soc.," No. 3, pp. 98-100). The principal congregations are the two mentioned above and Beth Israel, Beth Jacob, and Mishkan Tefilah. 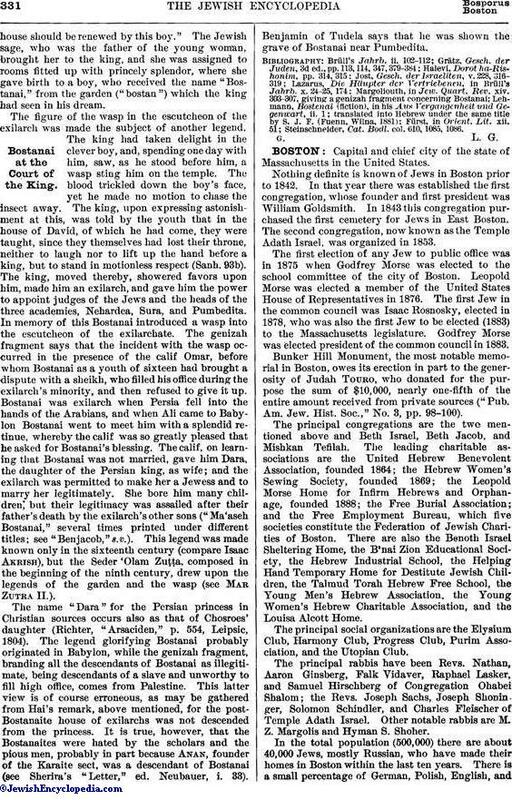 The leading charitable associations are the United Hebrew Benevolent Association, founded 1864; the Hebrew Women's Sewing Society, founded 1869; the Leopold Morse Home for Infirm Hebrews and Orphanage, founded 1888; the Free Burial Association; and the Free Employment Bureau, which five societies constitute the Federation of Jewish Charities of Boston. There are also the Benoth Israel Sheltering Home, the B'nai Zion Educational Society, the Hebrew Industrial School, the Helping Hand Temporary Home for Destitute Jewish Children, the Talmud Torah Hebrew Free School, the Young Men's Hebrew Association, the Young Women's Hebrew Charitable Association, and the Louisa Alcott Home. The principal social organizations are the Elysium Club, Harmony Club, Progress Club, Purim Association, and the Utopian Club. The principal rabbis have been Revs. Nathan, Aaron Ginsberg, Falk Vidaver, Raphael Lasker, and Samuel Hirschberg of Congregation Ohabei Shalom; the Revs. Joseph Sachs, Joseph Shoninger, Solomon Schindler, and Charles Fleischer of Temple Adath Israel. Other notable rabbis are M. Z. Margolis and Hyman S. Shoher. In the total population (500,000) there are about 40,000 Jews, mostly Russian, who have made their homes in Boston within the last ten years. There is a small percentage of German, Polish, English, andPortuguese Jews. There are also many native-born American Jews in the city. Many of the Boston Jews are engaged in mercantile and manufacturing pursuits; there are several physicians, musicians, and lawyers; but the majority are carpenters, painters, builders, masons, plumbers, etc.